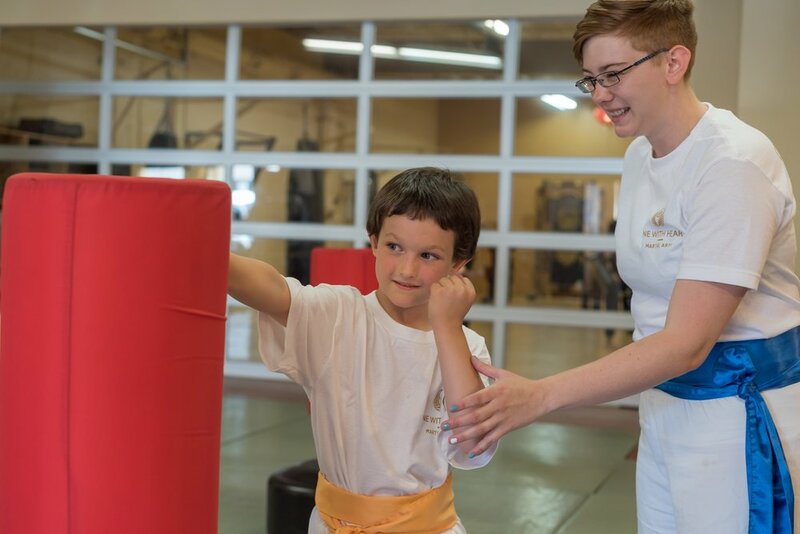 Keep your child fit, focused, and having fun in our premier martial arts program for kids! 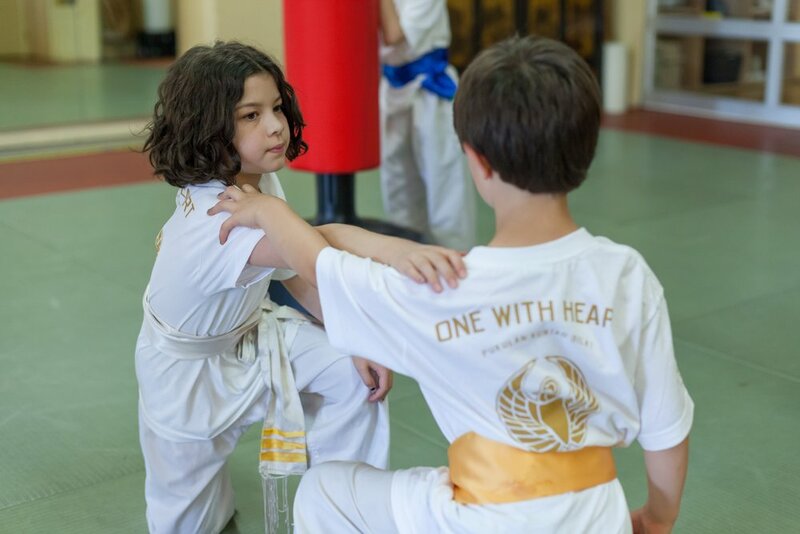 Your child will quickly develop into a calm, cooperative, and confident person as he or she participates in daily Kung Fu classes that focus on skill development and creative movement. One With Heart requires signed safety waiver and medical release forms one week in advance of the beginning of the school year. Call or email our Kids Program Coordinator with questions and about registering. Danielle loves “ah-ha moments” when a child suddenly lets go of thought and moves with his or her own unique grace and beauty. She has an exceptional ability to be at once animated and focused, energetic and calm, demanding and compassionate, and this serves her well in her role as the Kids Program Coordinator. One With Heart's After School Kung Fu program. Our Kids Day Camps (for ages 6-11) make school holidays and in-service days easy for parents and fun for kids! We invite your children to join us for energetic martial-arts-inspired games and Pukulan Kung Fu lessons throughout the school year. They will love taking a break from their desks and moving like monkeys, tigers, snakes, and cranes, and you will love seeing their shining faces at the end of the day. Beginners are welcome! Your child will have fun, get fit, and learn valuable self-defense skills in our Pukulan classes! They will love punching, kicking, falling, rolling, tumbling, and moving like Pukulan’s monkey, tiger, snake, and crane. Kids gain self-control, patience, and confidence along the way. Your child’s training begins in Kuntao, or basic self-defense. 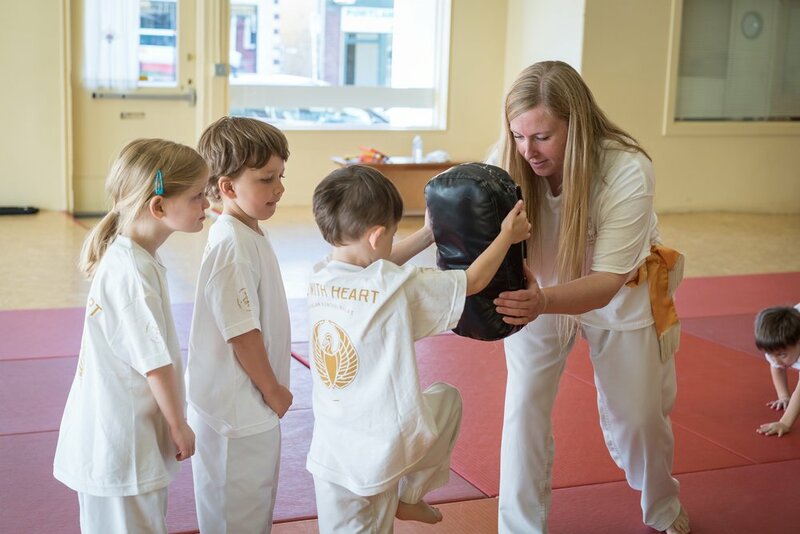 In this inclusive and age appropriate environment, kids learn the structure of our classes, develop respect for self and others, and learn basic forms and self-defense techniques. After completing Kuntao, which takes six months to a year, your child is promoted to White Sash and the next level of training. Here they learn more advanced movements and continue to develop self-reliance, focus, and leadership skills. In intermediate training students learn the fighting applications to their movement and begin light sparring with protective equipment. We celebrate students progress as they test for the ranks of gold, blue, green and brown sash up to the rank of black belt and beyond. Intros are 2 weeks long, 2 classes per week, and start at the beginning of every month. Intros are based on availability within the class. If the class you are interested in is waitlisted, we will contact you and put your child on the waitlist, for the first month there is space available. $159/month with an annual agreement. Cancelation on 60 day notice. You receive two classes per week with this membership. Beginning Martial Arts For Boys and Girls. Little Monkeys is a high-energy, non-competitive outlet for small children to do what they do best–play! Guided by patient, expert instructors, your Little Monkey will revel in the joy of movement while developing balance, coordination, strength, and awesome moves in a safe and cooperative atmosphere. For girls and boys ages three to five. Schedule a time to observe the Little Monkeys in action. New students are always welcome! First and last month’s tuition and price of uniform ($33) is due at time of enrollment for a total of $171. Little Monkeys Level 2 - 10:15 – 11:00 a.m. In our fun and practical Kids Self-Defense workshops, kids develop the confidence to trust their feelings, set boundaries, and act on their own behalf. You gain peace of mind knowing that your child has what it takes to respond to bullying and other unwanted behaviors. Through storytelling and role plays kids learn to recognize and respond to unwanted behavior from bullies, strangers, and familiar adults. They practice using voice and body language to set clear boundaries. They learn simple striking techniques and they learn when it is appropriate to use them. We believe real strength is the confidence to be who you are. Our Kids Self-Defense workshops help your child become his or her strongest, most authentic self. Parents are encouraged to attend, but not required. Contact us and we can arrange a workshop for your group or organization. Our next workshop is scheduled for Saturday, April 13 2019 from 2 - 4 p.m.
How did you first find Pukulan? When I moved to Portland I serendipitously lived just a few doors down from One with Heart. Although I walked past the studio nearly every day, I don’t remember ever ‘planning’ to start training. 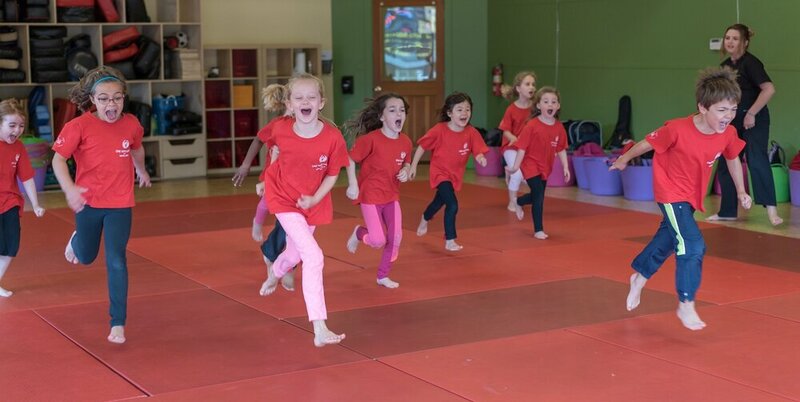 In our Kung Fu Summer Camps, children of all experience levels will gain focus, fitness, and confidence as they learn new skills, train and play in Portland’s sprawling parks. Children experience the joy of creative movement inspired by Pukulan kung fu’s four animal style: monkey, tiger, snake, and crane. What more could your child–or you–want?! Extended day camp hours 3:00-5:30 for an additional $100 per week.